"Ack Ack" (Anti-Aircraft) Artillery. 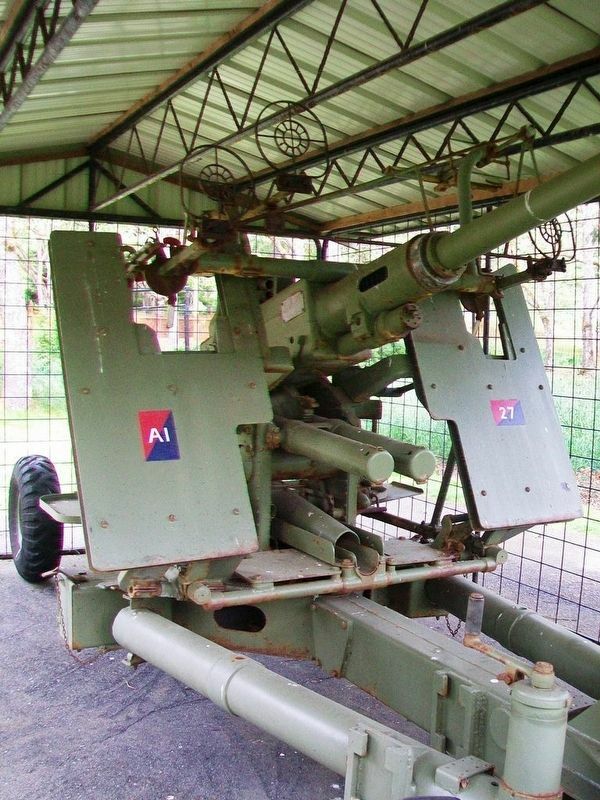 La DCA (artillerie antiaérienne)—. During the First World War, Victoria was unprepared to fend off air attacks. In 1921, the 2nd AA (Anti-Aircraft) battery was formed in Victoria. No AA guns existed in Canada, so the unit made do with 13-pounder guns on a locally improvised mounting, brainchild of Lt. J. Rycroft. Despite such ingenuity, a secret defence report of 1928 condemned this old equipment, calling the 13-pounders "obsolete", and mentioning that only "two sets of (height-finding) equipment are available and have sometimes been made to work." 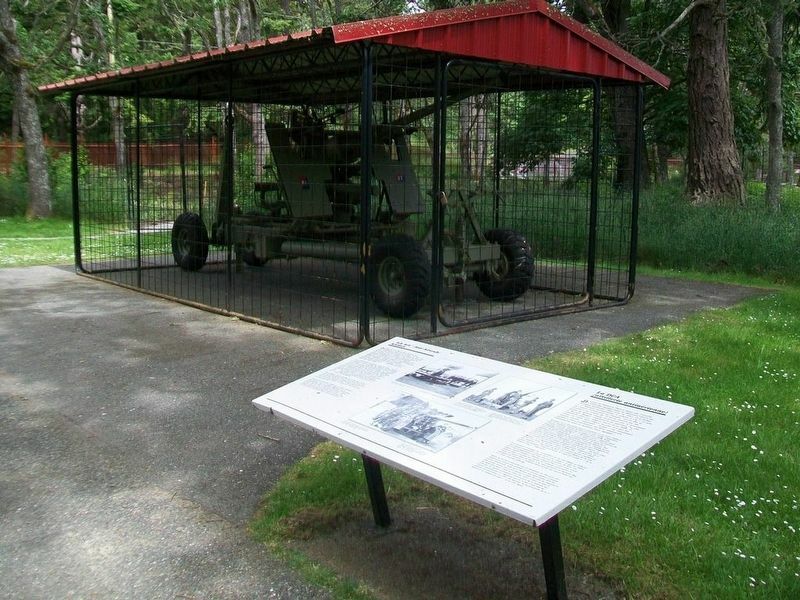 More equipment arrived—including the 3.7-inch heavy AA gun—until the Victoria-Esquimalt area was well-covered with AA sites. These included Tillicum (now a shopping mall), Colwood Racetrack (now Juan de Fuca Recreation Centre), Pat Bay air base (now Victoria International Airport), the present site of the Laurel Point Inn, and many others. After the Second World War, emphasis on AA defence increased, and a number of units were formed, including the 8th AA Operations Room, which trained here at Rodd Hill's Plotting Room between 1949 and 1954. In 1951, this unit recruited 31 women—the first women ever to serve in Canada's Reserve Force. The regiment's connection with AA defences ended in December 1954, when the 5th West Coast Harbour Defence Battery was formed. . —————————— . Durant la Première Guerre mondiale, Victoria n'était pas équipée pour se défendre contre les attaques aériennes. Plus tard, en 1921, on y forma la 2e Batterie antiaérienne, et comme il n'y avait pas de canons antiaériens au Canada, l'unité dût se contenter de canons de 13 livres montés sur les affûts de fortune conçus localement par le lieutenant J. Rycroft. Malgré l'ingéniosité du système, [?] été condamné dans un rapport secret de la Défense, rédigé en 1928, dans lequel on peut lire que les canons étaient « dépassés » et que « l'on réussissait parfois à faire fonctionner les deux dispositifs d'altimétrie dont la batterie était équipée ». On continua d'envoyer de l'armement sur la côte Ouest, y compris des canons antiaériens lourds de 3,7 po., jusqu'à ce que la région de Victoria-Esquimalt soit bien pourvue de postes de DCA. Ces postes étaient établis à Tillicum (aujourd'hui le site d'un centre commercial), à la piste de courses de Colwood (aujourd'hui le Centre de loisirs Juan de Fuca), à la base aérienne de Patricia Bay (aéroport de Victoria), à l'emplacement actuel du Laurel Point Inn, et à bien d'autres endroits. After the Second World War, emphasis on AA defence increased, and a number of units were formed, including the 8th AA Operations Room, which trained here at Rodd Hill's Plotting Room between 1949 and 1954. In 1951, this unit recruited 31 women—the first women ever to serve in Canada's Reserve Force. The regiment's connection with AA defences ended in December 1954, when the 5th West Coast Harbour Defence Battery was formed. les affûts de fortune conçus localement par le lieutenant J. Rycroft. Malgré l'ingéniosité du système, [?] été condamné dans un rapport secret de la Défense, rédigé en 1928, dans lequel on peut lire que les canons étaient « dépassés » et que « l'on réussissait parfois à faire fonctionner les deux dispositifs d'altimétrie dont la batterie était équipée ». Après la fin de la Seconde Guerre mondiale, la DCA prit une importance encore plus grande et un certain nombre d'unités furent constituées, dont la 8e Section des opérations (8th AA Operations Room), qui s'entraînait ici dans la salle de topométrie de Rodd Hill entre 1949 et 1954. En 1951, l'unité recruta 31 femmes, les toutes premières à faire partie de la Réserve des Forces canadiennes. Le régiment mit un terme à son rôle de défense antiaérienne en 1954, au moment de la formation de la 5e Batterie de défense portuaire de la côte Ouest. Location. 48° 26.008′ N, 123° 27.199′ W. Marker is in Victoria, British Columbia, in Capital Regional District. Touch for map. Marker is on the grounds of Fort Rodd Hill and Fisgard Lighthouse National Historic Sites of Canada. Marker is at or near this postal address: 603 Fort Rodd Hill Road, Victoria, British Columbia V9C 2W8, Canada. Touch for directions. Other nearby markers. At least 8 other markers are within walking distance of this marker. Coast Defence Artillery Positions: 1878-1956 (a few steps from this marker); Victoria-Esquimalt Fortifications (within shouting distance of this marker); Upper, Lower, Belmont Batteries (within shouting distance of this marker); Fisgard Lighthouse National Historic Site (within shouting distance of this marker); Heavy Metal and Drugs-in 1912? / La machinerie lourde en 1912... (within shouting distance of this marker); Upper Battery / Batterie supérieure (within shouting distance of this marker); 90 mm Anti-Aircraft Gun (within shouting distance of this marker); The Guardhouse / Corps de garde (within shouting distance of this marker). Touch for a list and map of all markers in Victoria. More. 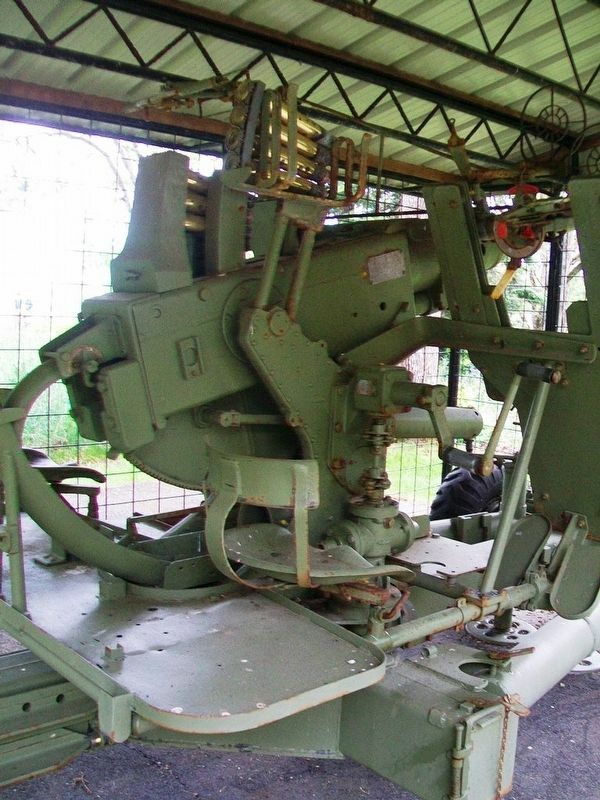 Search the internet for "Ack Ack" (Anti-Aircraft) Artillery. Credits. This page was last revised on August 16, 2017. This page originally submitted on October 21, 2016, by William Fischer, Jr. of Scranton, Pennsylvania. This page has been viewed 260 times since then and 5 times this year. Photos: 1, 2, 3, 4. submitted on October 24, 2016, by William Fischer, Jr. of Scranton, Pennsylvania.